Proof positive that people are wired differently: I'm a walking TV guide, able to tell you the day and time for each of my favorite shows, but my wife has no idea when anything's on. If not for our DVR, she'd never catch an episode of "Glee." If you're like her, you might appreciate Remember To Watch. True to its name, the service sends text-message reminders to your cell phone 30 minutes before a selected show is scheduled to air. 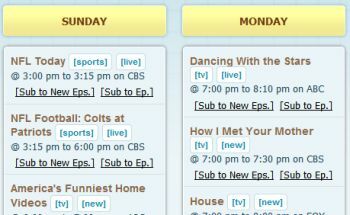 All you do is register (it's free), then choose the upcoming shows for which you want reminders. You can choose between a single episode or all future episodes (RTW is smart enough to limit those reminders to new episodes, so you won't get pinged about reruns). The only cost is whatever you pay for text messaging, as standard rates apply. Remember To Watch could definitely prove handy for people who aren't fortunate (?) enough to have TV guides in their brains. Thanks to reader HankA for sharing this tip!